CONGRATS to Laura + Greg! Today’s the big day for Laura and Greg, custom clients from San Francisco who hired us to create their Guerneville Wedding Suite. Their wedding sounds like a gorgeous, chillaxing affair with a romantic ceremony under the redwood trees in Guerneville, Calforinia – just off the Russian River. We had a lot of fun designing a tree-themed suite that combined a campy feel with a tone of formality. We utilized natural materials including real tree branch buttons, hand-dyed hemp and bark-embossed recycled paper for their Weekend Event Maplet. 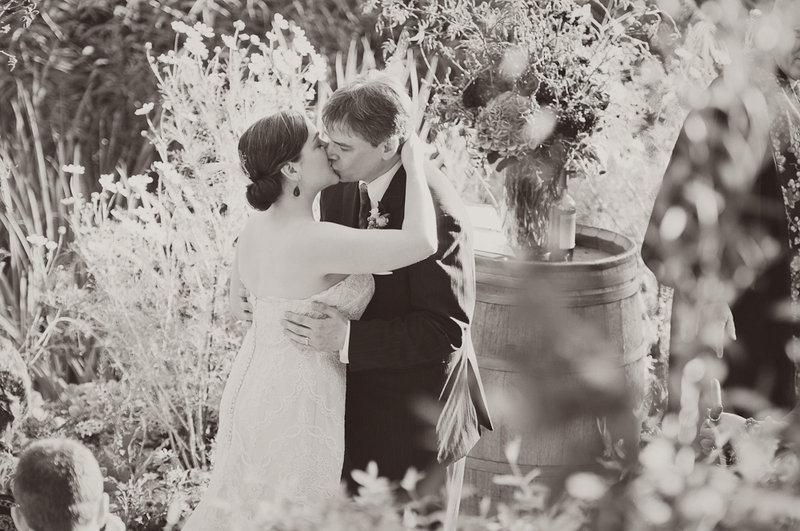 Congratulations Laura and Greg – may your happiness last longer than the redwoods are tall! Although I posted portfolio photos of our wedding invitation suite on our site weeks ago, I am only just now officially sharing the details on them. I can’t wait to share images from the event itself, and will finally be doing so in the coming weeks. Outer Envelope: Letterpress printed reply address and flat printed, ombre-effect recipient address on Crane’s Crest 100% cotton paper A9 envelope in ecru. Monarch Butterfly postage stamp from USPS. Not shown: envelopes were lined in pomegranate rice paper. Closeup of ombre-effect on flat printed recipient address on outer envelope. Enclosed invitation suite wrapped in a custom-illustrated map of the route from San Francisco (where we live) to Calistoga (where we got married!) Various wine appellations (Carneros, Rutherford, etc.) were highlighted with a wine-stained watercolor effect. Flat printed on canvas, wrapped around invitation and etceteras, and fastened with a wax seal featuring our initials and wedding date. Custom wax seal featuring our initials & wedding date. This was definitely Rocky’s favorite part! Detail of reverse letterpress printing. Instead of the text being pressed down, (as in traditional letterpress printing) the inked area around them was, so they had an embossed effect. Reply Card and Envelope: Reply card is letterpress printed on 110# Crane Lettra 100% cotton paper stock in ecru. Reply envelope is Moss Green with a custom rubber stamped return address and Rustic Garden stamps from USPS. Small flat printed insert featuring an engagement photo (of us walking on Baker Beach) and our wedding url. Not shown is the pomegranate rice paper backing, also used on the envelope liner. More to come tomorrow, when I share Part 2 of our suite, the “Day Of” collateral!